Over the past few days, the Armenian side has lost 4-5 servicemen, Azerbaijan’s Defense Ministry told Trend Sept. 17. 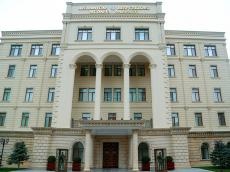 The ministry noted that the information disseminated by the Armenian side that the Armenian Armed Forces allegedly killed three Azerbaijani servicemen is false. "This is disinformation disseminated for the Armenian internal audience in order to conceal the losses of the Armenian side," the ministry said. It was also noted that unlike the Azerbaijani side, the Armenian side has recently lost 4-5 servicemen, but hides it from the public in every possible way. “As for the wounded Armenian civilian, Azerbaijan’s Defense Ministry states that the units of the Azerbaijani army don’t open fire at the civilian population and settlements,” the ministry said.